Gunslinger Girl: Il Teatrino tries to grab our attention once again to the story of a group of unfortunate girls turned into government assassins, however, the story doesn't take off and all that is left is an uninteresting, unrefined anime. My first reaction was, "will this be a better story than the last?". Well, honestly, I found the sequel really boring and a chore to watch through. The action was quite limited to a few minutes whilst the episodes mostly featured just dialogue and plenty of flashbacks and self-reflective moments. I found these quite irrelevant to the overall story. The story felt stagnant and did not take off at all throughout the whole series. Simply put, each episode was either a assassination or protection of some random guy by these girls, or a filler flashback episode. The anime lacked feel and emotion is some scenes. In the end, I still did not get to know the story and the characters that well, and I didn't care that much in the end. The art was slightly improved from the prequel with now the use of high definition quality graphics. However, the action was limited and so most of the time you will be looking at talking heads. Also, there was just too many flashback scenes that just ruined the enjoyment of the anime. Animation was rather limited, but backgrounds were nicely done. In my opinion, some character's voice has changed slightly from the transition of production studios. As a result, the warmth and feel from the prequel is genuinely lost through this change. That was really the big issue, but the characters all felt too boring and expressionless (due to the voice acting maybe). Perhaps this was intended to portray a "real-life" scenario anime which is pretty much all doom and gloom. The characters were really boring. None of them were that memorable and the story just keeps on jumping around between every character in the anime so you do not get to stick with one single main character. This was rather frustrating and made the anime rather bland in character development. Even now, I can;t really remember most of the character's names and personality because the anime just doesn't explain them properly. There were quite a few flashbacks that did talk about the past, but even then, it felt so irrelevant to the story at hand it just felt that the anime was just dragging the story along. 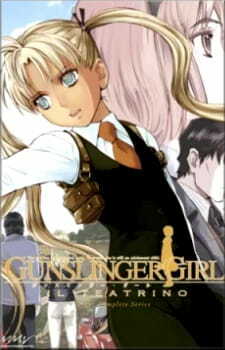 In the end, I honestly have to say that Gunslinger Girl: Il Teatrino took me a long time to finish. I kept on putting it down after a couple of episodes and watch some other anime instead. So this cycle kept on repeating until I managed to finish the series. Even then, I did have to skip quite a few segments in the anime due to boringness of the story. I decided to read the episode summaries on Wikipedia instead and that gave me a much more overview of what happens in the anime. Sure enough the concept was good, a bunch of assassin girls in an Italian city, but the execution was quite poor and there was just too much realism to it and no fan service at all. That said, this anime maybe more of a fictitious documentary that aims to inform rather than entertain; and I certainly wasn't informed nor entertained. I am being generous here, I did manage to finish it, so at least I do understand the situations the girls are in and how society works. Other than that, it was plain boring. Better than the prequels, but I felt the laziness of the animators creep through due to the limited fight scenes and the overuse of grainy flashbacks. It was pretty good, but some quality was lost due to the transition of production companies. I really didn't care about any if the characters that much, and the story did a poor job in developing them. I didn't enjoy the anime that much. The story was boring to watch and the characters were just emotionless. Not really worth your time if you are expecting epic fights and fan service, it is not that type of anime.